Toll roads or turnpikes were first introduced in Great Britain during the 16th century as a means to help maintain roadways. Today, there are a range of toll roads in the UK. 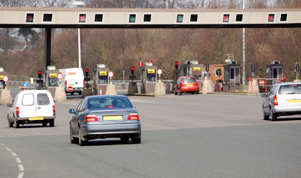 Tolls are charged on motorways, bridges and tunnels, as well as urban roads. There is one toll motorway in the United Kingdom, although a second is planned for the M4 motorway in Wales. Also known as the Birmingham North Relief Road or the BNRR, the M6 Toll connects Junctions 4 and 11A of the M6 Motorway. The six-lane toll road forms part of the E05 between Wolverhampton and the National Exhibition Centre (NEC) in Birmingham. Proposals for the toll motorway were first developed in 1980 with the intent of alleviating congestion on the M6. Following public consultation, the M6 Toll was approved in 1997 and opened in December 2003. The weekday charge for a Class 2 vehicle such as a car is £5.50 and £11.00 for a Class 4 and 5 vehicles such as heavy goods vehicle (HGV) and vans. In addition, fees for Class 1 vehicles including motorbikes are £3.00, while Class 3 vehicles such as cars with trailers are charged £10.00. Reduced rates are typically available at exit and entry at certain intermediate junctions where main toll booths are not present. A 5 percent discount is also available for drivers who purchase a tag at £1 per month. There are two congestion pricing zones in London and Durham. Charges are aimed at reducing congestion in city centres. Penalties are levied when drivers do not pay the charge unless exceptions are sought from local authorities. Enforcement is typically based on automatic number plate recognition. The Durham City congestion charge was introduced in 2002 and covers Saddler Street in the city centre. The toll aims to reduce traffic along the corridor that links Durham Cathedral and Durham Castle. A charge of £2 is paid upon exiting the congestion zone Mondays to Fridays between 10:00 and 16:00. Launched in 2003, the London congestion charge zone is the largest of its kind in the world. A standard charge of £10 is levied each day between 07:00 and 18:00 except for weekends, public holidays and the period between Christmas Day and New Year's Day. The boundary of the congestion charge zone includes the area within the London Inner Ring Road. The Dartford Crossing, also known as the Dartford-Thurrock River Crossing and the Dartford River Crossing, connects Dartford and Thurrock across the River Thames. Built between 1963 and 1991, the crossing includes two road tunnels and the Queen Elizabeth II Bridge. Located east of Central London, the Dartford Crossing features tolls for both directions. Tolls are payable in cash or through the discounted pre-paid DART-Tag scheme. Daytime rates are ₤2 for cars, ₤2.40 for light goods vehicles, and ₤5 for heavy goods vehicles. There is no charge for motorcycles. Linking Barton and Hessle, the Humber Bridge near Kingston upon Hull spans 2,200 metres or 7,280 feet. It was opened in 1981 and is the seventh-longest single-span suspension bridge in the world. Charges to cross the bridge are ₤1.50 for cars, ₤12.00 for heavy goods vehicles and no charge for motorcycles. There are two toll bridges that traverse the River Severn. The Severn Bridge opened in 1966 and links South Wales and Gloucestershire. While motorcycles cross the bridge free of charge, tolls for cars are ₤6.20 and ₤12.40 for vans. Heavy goods vehicles are charged ₤18.60. The Second Severn Crossing on the M4 motorway was completed in 1996. Tolls for the bridge are the same as those for the Severn Bridge and are paid only when travelling west. The Tamar Bridge was the longest suspension bridge in the UK when it opened in 1961. Widened in 2001, it crosses the River Tamar between Cornwall and Devon. The five-lane bridge features tolls of ₤1.50 for 2-axle vehicles under 3.5 tones, ₤3.70 for 2-axle vehicles over 3.5 tones, ₤6.00 for 3-axle vehicles, and ₤8.20 for vehicles with 4 or more axles. Vehicles with trailers are charged higher rates, while vehicles subscribed to the bridge's tag scheme are charged discounted rates. In addition to the Dartford Crossing, toll tunnels in the UK include in the Mersey and Tyne tunnels. The Mersey Tunnels link Liverpool and the Wirral Peninsula. The crossing includes the Queensway and Kingsway tunnels, which opened in 1934 and 1971 respectively. It also features a railway tunnel built in 1886. Tolls are ₤1.60 for cars and light goods vehicles up to 3.5 tones, ₤3.20 for cars and lights goods vehicles up to 3.5 tones with a trailer and heavy goods vehicles with two axels, ₤4.80 for heavy goods vehicles with three axles, and ₤6.40 for heavy goods vehicles with four or more axels. Discounted rates are also available with the crossing's tag scheme. The Tyne Tunnel features two 2-lane crossings under the River Tyne. Located near Newcastle upon Tyne, the tunnels were completed in 1967 and 2011. Both Tyne Tunnel and the New Tyne Crossing feature a toll charge of ₤1.60 for cars, ₤2.50 for vans, trucks and busses, and no charge for motorcycles. Discounted rates are also available for through the tunnel's tag programme. Several small bridges also levy tolls. Charges are typically under a pound for most vehicles. Bridges include Aldwark Bridge in North Yorkshire, Batheaston Bridge in Bath, Cartford Bridge near Blackpool, the Clifton Suspension Bridge in Bristol, Dunham Bridge along the A57, Itchen Bridge in Southampton, and the Kingsland Bridge in Shrewsury. Additional toll bridges include Swinford Bridge in Oxon, Warburton Bridge in Trafford, Whitchurch Bridge on the B471, and the Whitney-on-Wyne Bridge on the B4350. Toll transporter bridges also operate in Newport and Middlesbrough.